We are Cheri Fellinger & Marcel Marckelbach the proud owners of Kawako Shiba Inus. We are the humble stewards of this wonderful breed with a small breeding program focusing on temperament, trainability, health & beauty. We are located between Portland, Oregon and Seattle, Washington. Our dogs are primarily our family pets but they are also beautiful, well trained show dogs. There's absolutely no reason why a dog can't be both. We have been training & showing dogs for nearly 40 years and we have the experience to produce well bred, properly raised and socialized puppies, youngsters and trained adult dogs. Most of all it is our pleasure to place our healthy, happy, quality Shiba puppies in the loving homes of the wonderful individuals and families we get to meet while pursuing our passion. A well bred, well raised adult Shiba Inu is truly a thing of beauty and of course Shiba puppies are simply adorable. The Shiba can make a wonderful family dog or make a perfect companion for a single person. Shibas are very attractive dogs, especially to people who don't typically like small dogs. They are clean, quiet, easy to live with dogs that are just the right size for both a house dog and a traveling companion. However, there are some things about Shibas that most people don't know and/or fully understand that you must be aware of before purchasing a Shiba. Read more about that at our About Shibas page. We only have puppies occasionally and we do not sell puppies strictly via the Internet nor do we sell or ship puppies without an in-person visit. 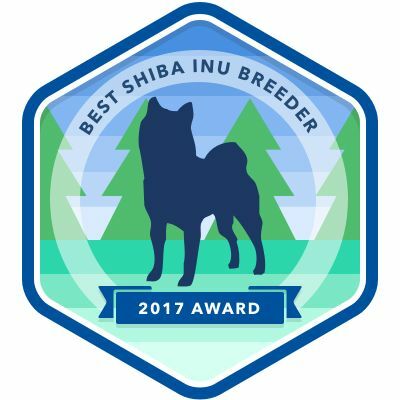 We are also very selective about who we place our puppies with as Shibas need and deserve owners who will commit to their special requirements. You can read my BLOG or visit my Cafe`Press Shop which offers my artwork printed on mugs, T-shirts, sweats, tiles, baby items, pins, magnets and other items. You can visit our Mobile Site to see more candid photos of our dogs or check us out on Facebook. Enjoy! us when looking for a Shiba Inu Puppy in the Pacific Northwest. Producing all-round quality Shibas with wonderful temperaments is the goal but producing beautiful black and tans is our passion. You can see many pictures of our black and tan puppies if you visit Cheri's facebook page. If you have one of our puppies please share pictures on Cheri's page so everyone can see them. A huge thank you to all who provide such wonderful loving homes to our puppies.